Does anybody have special Valentine's or Galentine's Day plans? Erlend and I do NOT have any, and I am more than okay with that. The Valentine's Day industrial complex is strong in New York City. Our regular restaurants are offering crazy prix fixe prices for a limited menu, and there are vendors at every subway stop shilling overpriced, wilted roses. Even the Valentine's candy here is twice as expensive as everywhere else! Aside from that we're also not really the romantic type — neither of us know when our anniversary is, and it always takes us a minute to figure out how long we've been together. * So I think we'll pass, thanks. *Don't mistake that for indifference; Erlend is my Valentine, through and through. He's the Type B to my Type A, the ying to my yang, etc, etc. 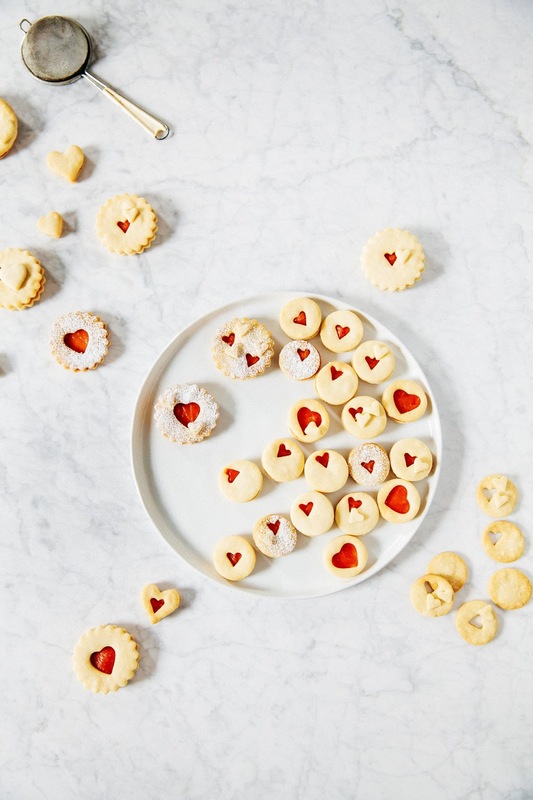 Truth be told, these linzer cookies are about as festive as I'm willing to get for Valentine's Day. Which doesn't seem like too much of a stretch for the special occasion, but it actually is. Why? I kinda sorta hate making rollout cookies. Although I have always loved eating them, I definitely groaned when they exploded in popularity over the last few years (thanks to the really awesome Instagram accounts of @bakedideas, @vickiee_yo, and a bunch more folks I don't have room to name). 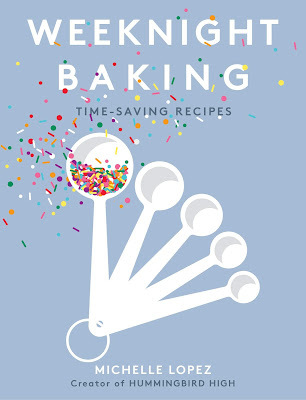 Look through my Recipe Index — I barely have any recipes involving rollout cookies! I pretty much avoid making them at all cost. I'm also just really bad at it. I'm terrible at bringing the dough together (like... is it supposed to have the texture of chocolate chip cookie dough, or something else?). I'm even worse at rolling them out evenly and shaping them with cookie cutters. I don't have a trusty recipe, and a bad recipe can leave you with deformed cookies with a bad texture. The texture is either too hard and brittle, or too soft to hold up against a jam filling. 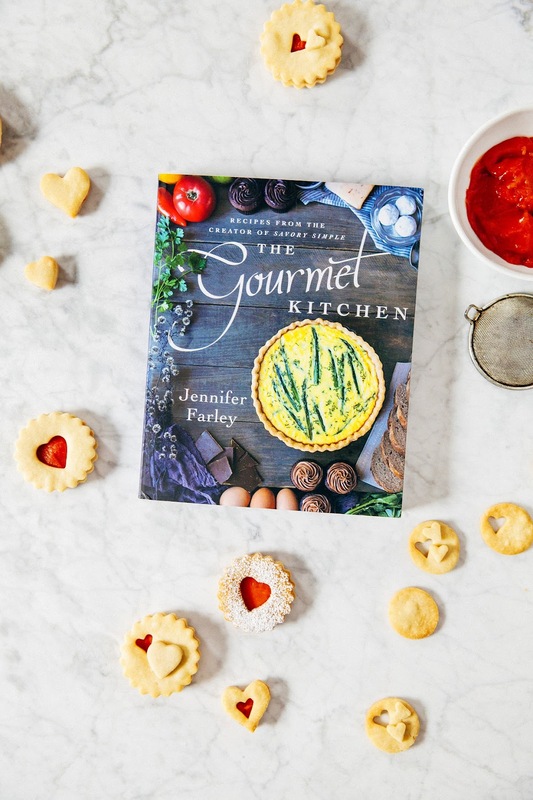 When Jennifer from Savory Simple sent me her cookbook, The Gourmet Kitchen, a few months ago, I bookmarked a bunch of delicious-looking recipes, including this one for blood orange curd linzer cookies. 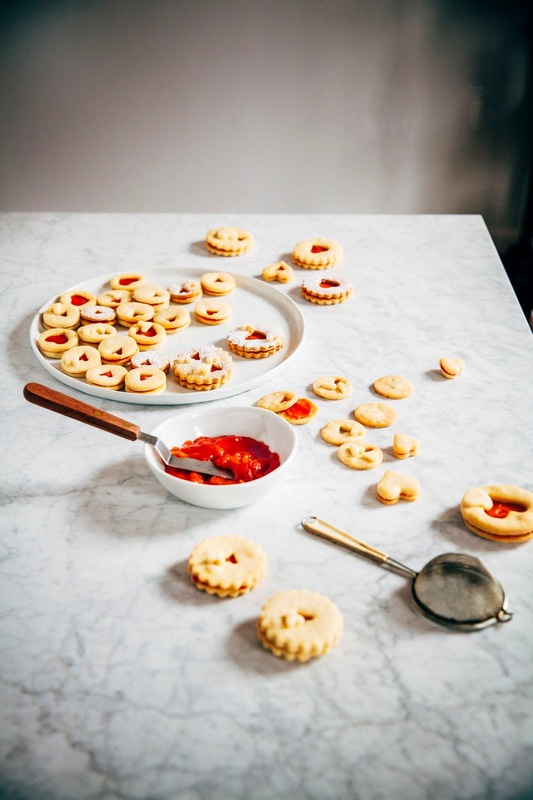 I fully intended to make another recipe (she has such delicious ones to choose from, like hot chocolate with salted caramel whipped cream and cherry vanilla jam crumb bars), but her linzer cookies kept stopping me every time I flipped through her cookbook. They were adorable enough to convince to try a rollout cookie recipe one more time. And I'm glad I did! Jennifer's recipe for linzer cookies worked better than any that I've tried in the past. 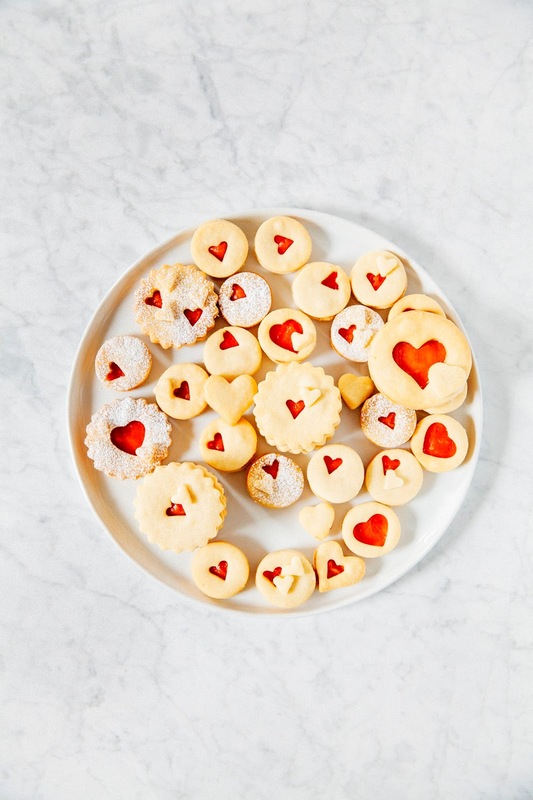 Based on a shortbread dough, the cookies come together easily and hold their shape in the oven beautifully. 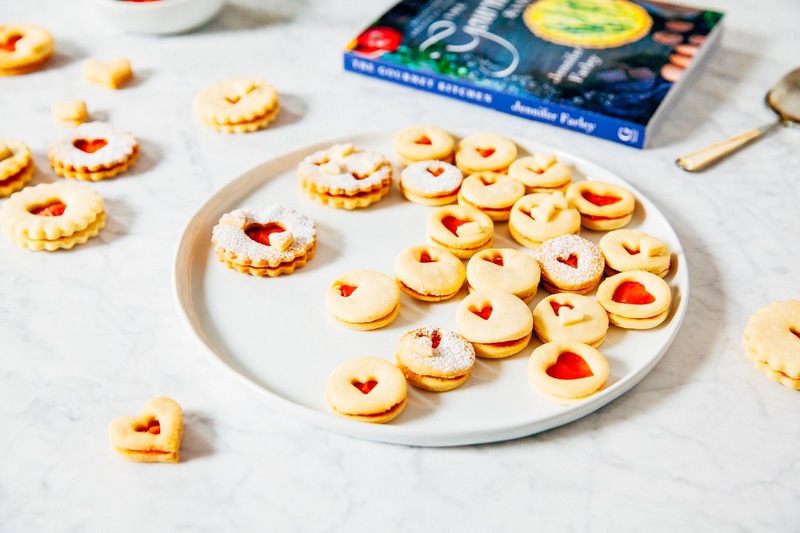 They're also delicious, with a strong butter and vanilla flavor that pairs well with Jennifer's sweet, citrusy recipe for blood orange curd. Enjoy! The blood orange curd will be a little bit thicker than your typical curd or jam. This is okay — it's easier to keep the cookies together this way! You'll also end up with more curd than what's needed for the cookies. It keeps in a sealed mason jar for about 1 month; use the extra on pancakes, waffles, toast, and more! 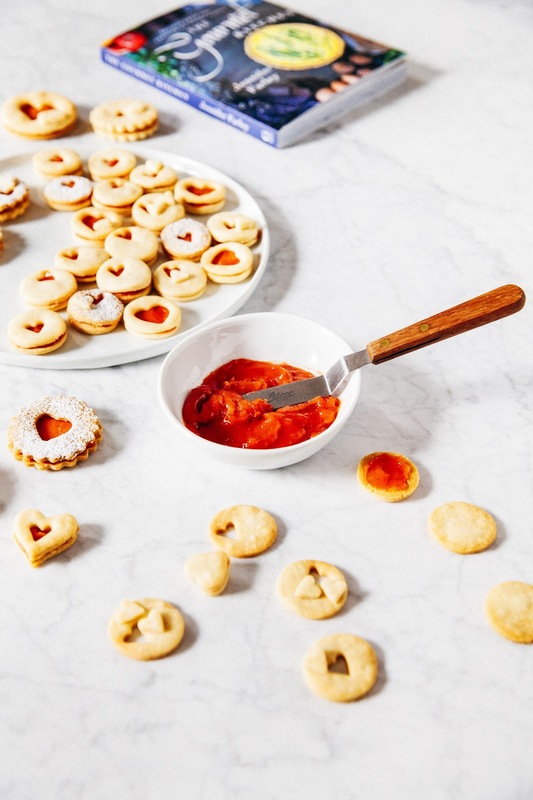 Linzer cookie dough is different from traditional chocolate chip cookie dough. It doesn't come together fully in the stand mixer; you'll need to do some kneading on your end to get it to a rollable state. The easiest way to handle it is to dump it on a sheet of plastic wrap, wrap it up, and knead it together until it forms a disk. No need to worry about overworking it like pie dough! It's very forgiving and will be delicious no matter what. Keep re-rolling the scraps into new cookie shapes to have as many cookies as possible! I was super ADD when I made these and couldn't decide on which cookie cutters to use. I ended up using all of them, resulting in cookies that are 1-inch, 3 1/2-inch, and 5-inch wide. As a result, I don't actually know how many cookies this recipe yields beyond what Jennifer says. I've included the yield and instructions as it is in her cookbook. Note that your yield will be different depending on what cutters you use as well. I used the following cutters: a super mini heart from this set, a small heart, circle cutters (from this set), and a fluted biscuit cutter. In a medium, heavy-bottomed saucepan, whisk together 3 large egg yolks, 2 large eggs, and 1 cup granulated sugar until smooth. In a separate bowl, whisk 3 tablespoons cornstarch with approximately 1/4 cup of the blood orange juice to create a slurry. Whisk the remaining 3/4 cup of blood orange juice and the slurry into the egg mixture along with 1 to 2 drops of red food coloring. Place the saucepan over medium heat and cook, whisking until thick, about 10 to 15 minutes. Make sure the whisk scrapes the bottom of the pan to prevent the mixture from burning. 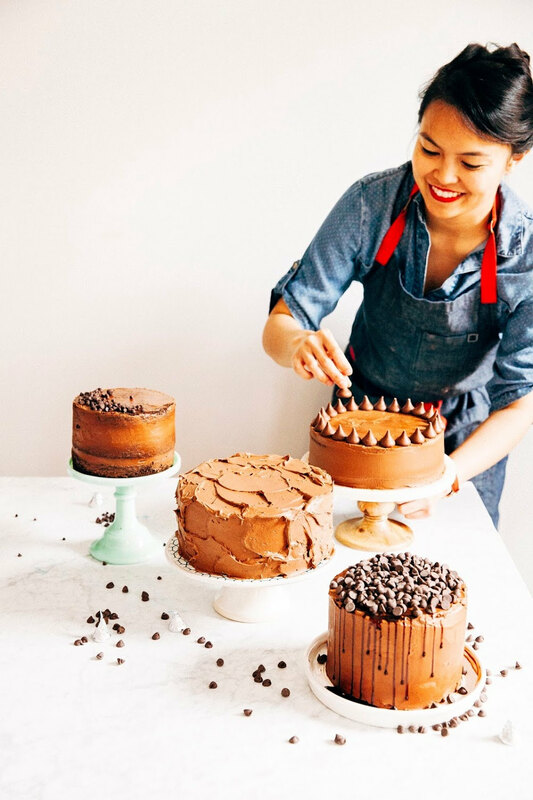 When the mixture has thickened considerably (your whisk should be leaving trail marks while stirring the mixture, and the mixture should also coat the back of a spoon), remove from heat and place on a wire rack. Whisk 1/2 cup cubed unsalted butter, 1 to 2 cubes at a time, only adding the next set of cubes when the previous cubes have fully incorporated into the mixture. Transfer the curd to a clean bowl and press plastic wrap against its surface to prevent a skin from forming. Chill in the refrigerator for at least 15 to 20 minutes. The curd will continue to thicken as it cools. In the bowl of a freestanding electric mixer fitted with a paddle attachment, combine 3/4 cup unsalted butter, 1/2 cup confectioner's sugar, and 1/2 teaspoon kosher salt. Beat on medium-high speed until light and fluffy, approximately 5 minutes. Add 1 teaspoon pure vanilla extract and turn the mixture to its slowest setting once the vanilla is fully incorporated. Add 1 3/4 cups all-purpose flour, 1 to 2 tablespoons at a time. Once all the flour has been added, increase the speed to medium and beat for 1 to 2 minutes, until the dough is evenly combined. Dump the dough into a sheet of plastic wrap. Bring the dough together by wrapping it up in the center of the plastic wrap, shaping it into a ball, and then flattening it into a disk. Chill in the refrigerator for at least an hour, but preferably overnight, until the butter firms up. When you're ready to roll out the dough, place approximately 1/3 of the the dough between two sheets of parchment paper (keeping the remaining dough chilled). If the dough is too hard to work with, let it sit at room temperature for 5 to 10 minutes, before giving it a few good whacks with your rolling pin. Roll the dough into a very thin slab, approximately 1/8 to 1/4-inch thick. 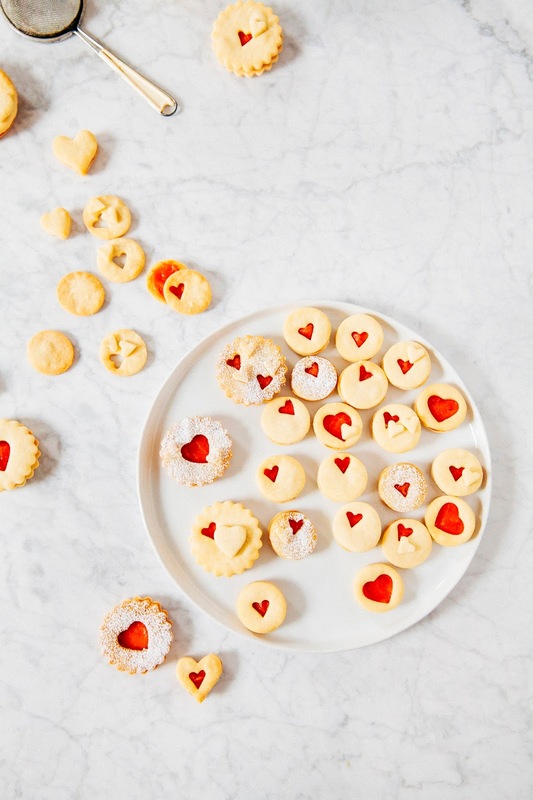 Use a 1 1/2-inch cookie cutter to cut the cookies into rounds. Place the rounds onto a parchment lined cookie sheet — you can have them pretty close together, they don't spread out that much in the oven! I left about 1/2-inch between each cookie. Gather the excess scraps into a ball and repeat the rolling out process until all the dough is used, including the remaining dough. 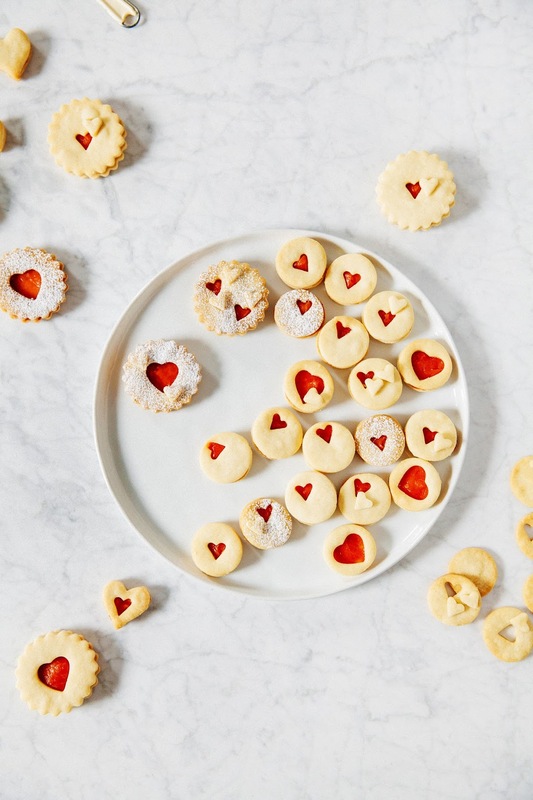 Use a small heart-shaped cutter to stamp out shapes in half of the rounds. Chill the dough in the freezer for at least 30 minutes. Center a rack in the oven and preheat to 350 (F). Once preheated, bake the cookies for 10 to 15 minutes — the cookies won't brown too much, so be careful not to overbake! 15 minutes in the oven should be the max. Transfer to a wire rack to cool to room temperature before sandwiching the cookies. When the cookies are at room temperature and you're ready to assemble them, spread about 1 teaspoon of blood orange curd onto the flat side of each uncut cookie round. Be careful not to use too much! When topping with the cut-out cookie top, the curd will spread across the cookies. If you use too much, it could potentially ooze over the edges of the cookie. Top with the cut-out cookie, and garnish with confectioner's sugar, if desired. Enjoy!